If you are looking for a premium shampoo at a great price then look no further then the Meguiar's Shampoo Plus! Using this quality shampoo will allow you to wash your vehicle safely and effectively. This shampoo produces an extra rich foam that will help in lubricating and conditioning the surface while washing. You'll notice the slick feel which allows you to remove contamination without introducing swirls and scratches that can often be caused during the washing process. It is extremely gentle so it will not strip off any protection from a sealant or wax. Another bonus of this shampoo is the conditioners it is packed with. These conditioners infuse the paint with moisture so that it looks vibrant, bright, and glossy. The formula deepens gloss, boosts shine, and leaves a highly reflective, slick surface when finished. 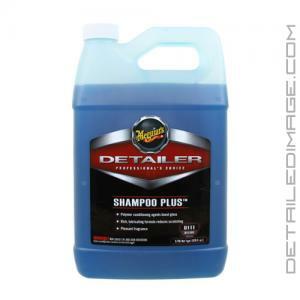 Simply add one ounce of Shampoo Plus to your 5 gallon wash bucket and you will have a great maintenance shampoo to use on any of your vehicles. Meguiar's Shampoo Plus lubricating formula and luxurious foam team up to gently clean and condition even the most delicate clear coat surface without scratching, It's conditioning formula deepens gloss, boosts shine and leaves a highly reflective, slick surface, making it the perfect choice for the ultimate wash. DIRECTIONS: Mix one ounce per one gallon of water. Wash Vehicle. Rinse thoroughly. Love this! Top quality soap. Pros - awesomeness perfect scent cons - none. This is the soap! I love this shampoo. It did dry fairly quickly but it did wash and rinse off fairly easy. Suds up really nice and don't have to use much. This jug will last a good while and I think in the long run it'll be one of my top choices for the price.